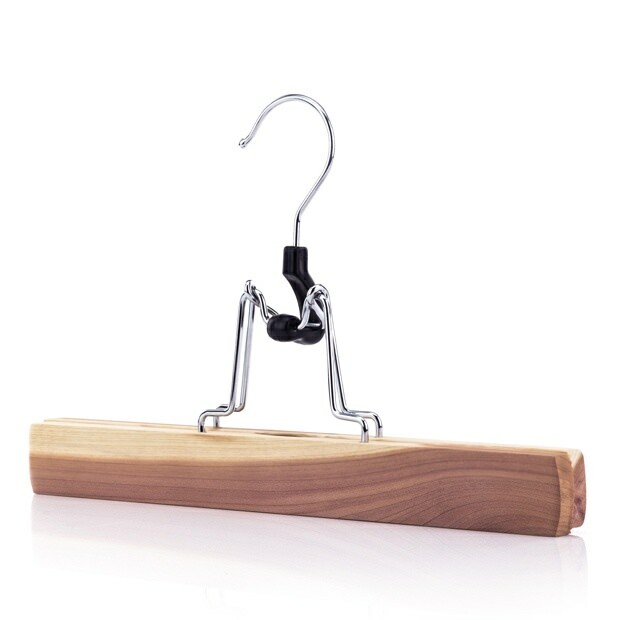 Our cedar clothes hangers are manufactured to a high standard using the best aromatic cedar wood available. All hangers are hand finished which includes a final light sanding. This may lead to a small amount of wood dust being present on the hangers which could transfer to garments. This is harmless and brushes off however we recommend that you give your hangers a wipe with a damp cloth before using them for the first time. Premium quality cedar wood clamp hangers. Naturally repels moths & insects and absorbs moistures & odours. Metal clamp hinge is secured by means of central plastic lock. Non-slip ridged grooves help keep garments in place. Holds trousers or skirts securely. Strong polished chrome hinge and swivel hook with smooth rounded end. Jaws are soft lined with felt to avoid marking fabrics. Also great for kids tops, smaller items etc. when hung upside down. Simply load garment and snap shut. Garments are held firmly in place. Strong, ingenious design. Can be used to hang from hems or waistbands of clothing. Size: Width 27cm (10.6") approx.